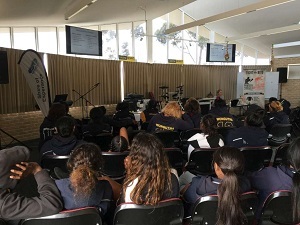 Wongutha students recently had a look under the microscope and learnt what is involved when working as a Shire of Esperance Environmental Health Officer. Students learnt about mosquitoes, studied them under a microscope and took away information on how to better protect themselves from mosquitoes at school and home. If your school is interested in including this area of Environmental Health in your Health or Science Curriculum do not hesitate to contact Health Services on 9071 0666 and a free 1-hour presentation can be arranged. Mosquito education can improve human health by reducing the exposure of mosquito transmitted diseases and environmental health by reducing the demand for chemical control of mosquitoes. The presentation is developed for primary and high school students. Students through this program learn how they can reduce mosquito breeding around their home, practice mosquito avoidance, report significant increases in mosquito numbers and promote mosquito awareness in the community.